or, the Seldom Collection. The online version of me. Hey all - it's been a while since I've posted, but I've been a bit busy figuring out how to be a dad. Yup, Amy gave birth to Sam on June 30, and all those "ToDo" items were suddenly unimportant. BUT...given two months off for summer vacation, and spending the better part of the previous school year trying to come to terms with the "processes" I use while I teach, it seems apparent (now) that I would stumble upon the GTD system. This is not a new idea to me - my colleague Pete Rodrigues introduced me to the concept of inbox zero - something that I strived for, and continually failed at, with my work email. Amy, my wife, immediately recontextualized that idea into Sink Zero, and we HAVE been able to maintain that fairly well (usually accompanied by a high five). I entered GTD through the back door - I found the tech first, realized a potential, and went searching for a system to help me utilize that potential. I am actually more interested in "processing" first, and collecting, etc. later. To clarify, by "processing," I really mean tweaking the system to meet my needs, my tech, my life. Once I have that, I will start the collection (yay). I am relying heavily on the magic documented in Ruud's post: Saved searches in Evernote. As he shows, you can create (and save) custom search strings that allow for very dynamic and malleable lists. I have taken a combination of Ruud and Daren's ideas about contexts, and still plan to use a somewhat static, but useful (I think) implementation of Allen's containers a la Evernote's notebooks (inbox, Reference, ToDo). Finally, Egretlist allows me the opportunity to work with the checkboxes in Evernote (and it is beautifully designed as well) - I can create new ToDo's or check off ones on the go. And, due to the magic of the searches, once it is checked off (i.e. done! ), it is automatically removed from the list. I decided to use "ToDo" instead of "Next Actions," for two reasons: it is shorter to type, and it is more practical...as in, what do I have TO DO right now (or later, etc.). I modeled this after Daren's context categories - you can read the basic descriptions of each there. So you know, @RR is "Read/Review," @SD is "Someday" (thanks, Ruud! ), and @WF is "Waiting For." My own little shorthand... Finally, the @ToDo is Allen's "Next Actions." The concept of context took me a while to grasp, mainly because I am, and I think many of us are, so tied to the idea of project, that we forget the places/tools we need to get those projects completed. For instance, I plan to repaint my porch (@SD). It makes no sense for me to review my ToDo list at work and have to think about porch painting - there is no way I can complete that task at work, so why waste the energy. I will wait until I review the @Home list and think about it then. Similarly, sometimes I need the web (@Online), sometimes I need to use a phone (@Call), and sometimes, I need to discuss something in person (@Agendas). It all depends on where I am and what I have at my disposal. 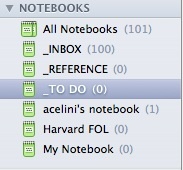 I haven't created all the searches yet, but you can see above that I can find all my next actions in my To Do list. 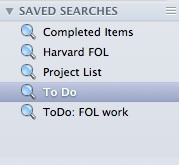 I also have a separate ToDo search tied to a specific project - the Future of Learning (FOL) conference I will be attending at Harvard next week. By tagging notes in Evernote appropriately, you can create custom searches very easily. It just requires some fore-thought. The real beauty of the system is the ability to search based on whether or not a checkbox is checked. The search term is "todo:false" for unchecked, or remaining, items to do. After that, you include tags you want to find, and exclude tags you don't want to see. For instance, in my ToDo search above, I have excluded the @SD tag, as I do not want my Someday items co-mingled with my ToDo items. I plan to create searches for each of my @context tags. Please see Ruud's post for all the search strings. Capture a new idea/task in a new note in Evernote. Title this task, if possible, with an Action (i.e. active verb, such as "Read," or "Call") and a specific subject/task (i.e. "John re: dinner on Fri). A completed Title would read: Call John re: dinner this Friday. The item will appear in one (or more) of my Saved Searches. When I call John, I check it off on my phone using Egretlist, and, voila!, it leaves my ToDo list automatically! Daily/weekly review of undone items - I can shift lists etc. and file into the appropriate notebooks. I know this muddles Allen's system a bit, but I figure that, after the initial, massive brain-dump collection, there must be a number of mini-collections throughout the day. Or, at a minimum, a daily review in the evening that sorts out the the next day's work. I hope this will enable me to deal with all the minutiae that I have to deal with each day as a teacher. As a tangent to this post, here's a someday item: create a routine for my home and work email inboxes that follows this process. It will have to involve rules and filters and the such, but I am sure it can be done (and I am sure someone has already started it!). I would love to hear some feedback on this idea, as I feel it pulls together a variety of tools. Of course, I will update with progress and changes as I use the routine. And sorry for the long post, but thanks for sticking it out! 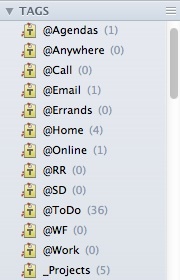 As a quick follow-up, in Mac Mail (Lion), you can flag messages with different colored flags. You can rename these flags. And you can create Smart Mailboxes based on criteria, one of which being the flag. Seems like all you need to do is set up some savvy rules and start flagging those inbox messages. Do you know how I can get the list that consists of only the To Do boxes from all Evernote notes onto my Mac (desktop) version of Evernote?